Through LdM Restoration and Conservation Certificate students are provided with the skills required to restore precious artwork from around the world. 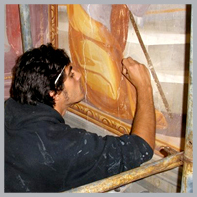 They participate in the restoration of frescoes and murals, work with self-made oil paints, and learn the techniques of filding and egg tempera. They also explore the differences between frescoes techniques on wet and dry plaster and work directly and exclusively on original artifacts from the 14th to 19th centuries.